Fr. John Francis Kamwendo, D.Th. and John E. Koenig, Ph.D. are self-publishing a book with Outskirts Press, and they want your help deciding the book cover. 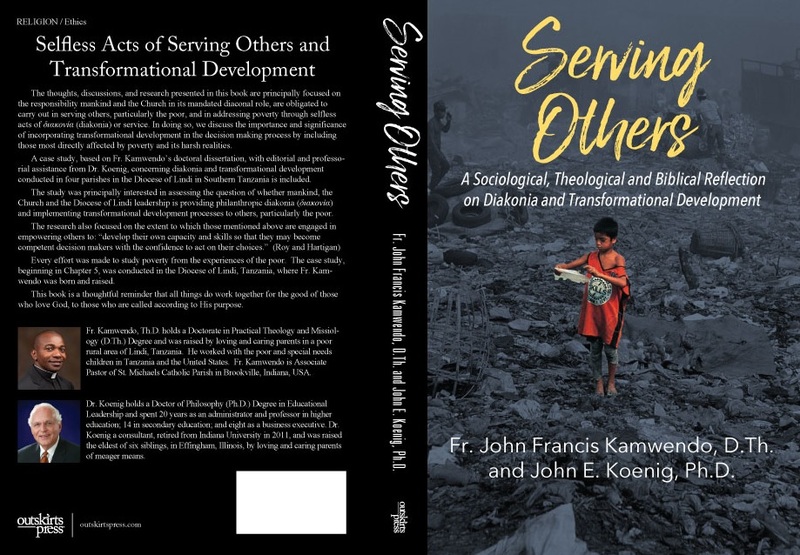 The thoughts, discussions, and research presented in this book are principally focused on the responsibility mankind and the Church in its mandated diaconal role, are obligated to carry out in serving others, particularly the poor, and in addressing poverty through selfless acts of διακονία (diakonia) or service. In doing so, we discuss the importance and significance of incorporating transformational development in the decision-making process by including those most directly affected by poverty and its harsh realities. A case study, based on Fr. 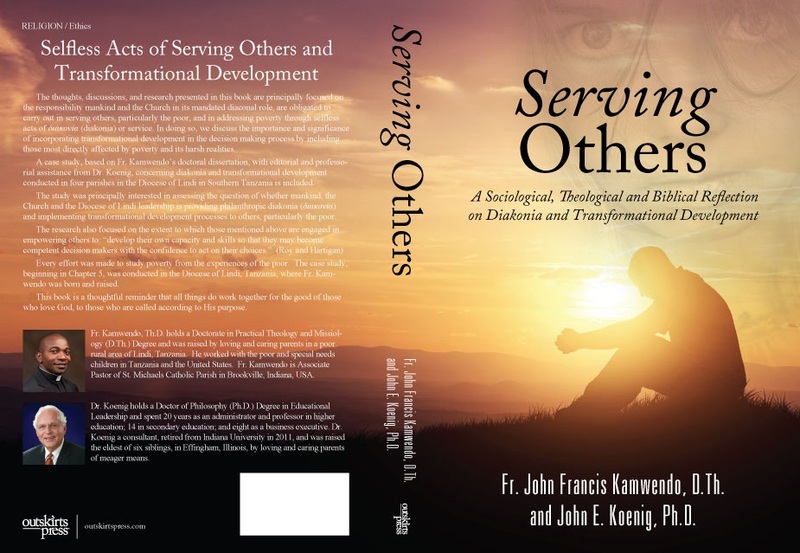 Kamwendo’s doctoral dissertation, with editorial and professorial assistance from Dr. Koenig, concerning diakonia and transformational development conducted in four parishes in the Diocese of Lindi in Southern Tanzania is included. The study was principally interested in assessing the question of whether mankind, the Church and the Diocese of Lindi leadership is providing philanthropic diakonia (διακονία) and implementing transformational development processes to others, particularly the poor. Every effort was made to study poverty from the experiences of the poor. The case study, beginning in Chapter 5, was conducted in the Diocese of Lindi, Tanzania where Fr. Kamwendo was born and raised. This book is a thoughtful reminder that all things do work together for the good of those who love God, to those who are called according to His purpose. Fr. Kamwendo, Th.D. holds a Doctorate in Practical Theology and Missiology (D.Th.) Degree and was raised by loving and caring parents in a poor rural area of Lindi, Tanzania. He worked with the poor and special needs children in Tanzania and the United States. Fr. Kamwendo is Associate Pastor of St. Michaels Catholic Parish in Brookville, Indiana, USA. Dr. Koenig holds a Doctor of Philosophy (Ph.D.) Degree in Educational Leadership and spent 20 years as an administrator and professor in higher education; 14 in secondary education; and eight as a business executive. Dr. Koenig a consultant, retired from Indiana University in 2011, and was raised the eldest of six siblings, in Effingham, Illinois by loving and caring parents of meager means.